1. The high levels of Vitamin C in dragon fruit can give the body’s immune system a boost while also stimulating the activity of other antioxidants to fight free radicals. 2. In addition to Vitamin C, dragon fruit also contains Carotene, Lycopene and Polyphenols which are linked to their anti-carcinogenic qualities, including reducing a number of tumors and lowering the risk for prostate and estrogen sensitive cancers. 3. Studies have shown that the mono saturated fats contained in dragon fruit may lower the risk of heart disease and high blood pressure as it decreases bad cholesterol levels while improving the good levels. 4. The high level of fiber in dragon fruit can help stabilize a person’s blood sugar levels. It also helps to inhibit the sugar spikes that occur after eating high glycemic index foods. Regular consumption of this fruit could be beneficial in preventing common issues linked with diabetes. 5. Dragon fruit’s fiber content can also improve the body’s bowel movements by facilitating the passage through the digestive tract which can help reduce the occurrence of constipation and irritable bowel syndrome. 6. Lastly, the high levels of antioxidants and Phosphorus found in dragon fruit could assist in preventing premature aging. 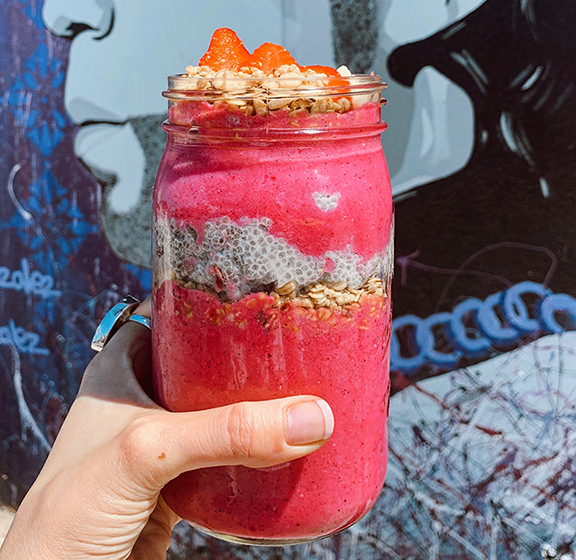 So the next time you see fresh pitaya, grab em and create your dream smoothie mix. Get the latest news and tips delivered fresh from my blog to your inbox.